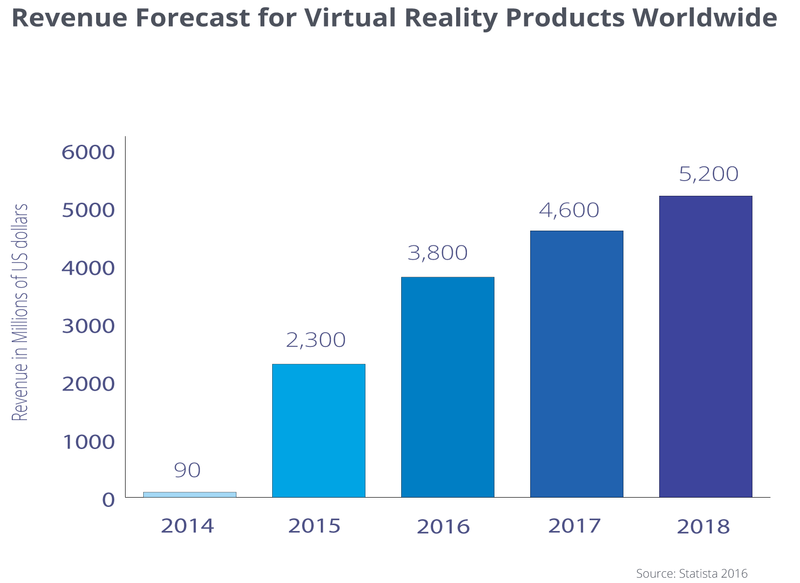 VR technology has evolved dramatically in recent years, companies like Samsung, Sony, Google and Oculus and HTC are now all names associated with VR for gaming, social and mobile platforms. As with most new technology the devices are still quite expensive, so in order to give them mass appeal they would need to become more affordable. In the coming months we will see how the new tech fares with public opinion. We reached out to some of the top 20 influencers to ask them for their views on Virtual Reality. We spoke to Daniel Corey (#2), Rob Crasco (#5), Sanem Avcil (#10), Eva Hoerth (#11), Bob O’Donnell (#14) and Brennan Spiegel (#15). Be sure to follow them to stay up to date on the best content and resources on Virtual Reality. 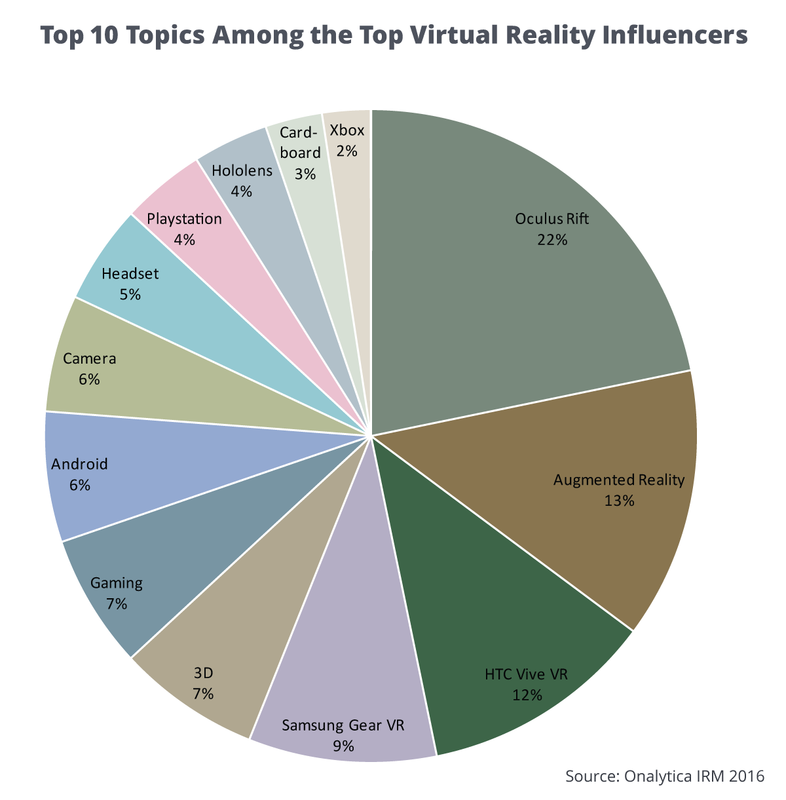 It’s interesting to note that the most popular topic among the virtual reality influencers was Oculus Rift with a 22% share of voice, proving that Oculus is leading the discussion and driving the most conversations among the top influencers. Augmented Reality was the 2nd most popular debate driver, followed by mentions of HTC Vive and Samsung Gear VR which both received a significant 12% and 9% share of voice respectively. Other frequently mentioned topics among the top influencers included 3D, Gaming, Android, Camera and Headset which all received a similar share of voice (ranging from 5-7%), followed by mentions of Playstation and Hololens with 4%. Google Cardboard came in at 2% while Xbox received 2% share share of voice among the top virtual reality influencers and brands. We were very interested in seeing which virtual reality professionals and brands were leading the online discussion, so we analysed 797K+ tweets from March 8th – April 7th 2016 mentioning the keywords: #VR OR “Virtual Reality” OR virtualreality. We then identified the top 100 most influential brands and individuals leading the discussion on Twitter. What we discovered was a very engaged community, with much discussion between individuals and brands. Below you can see a network map of the online conversation with the number 1 brand Oculus at the centre. This map was created with our Influencer Relationship Management software (IRM). Be sure to click on the map to enjoy the full size network diagram in greater detail. 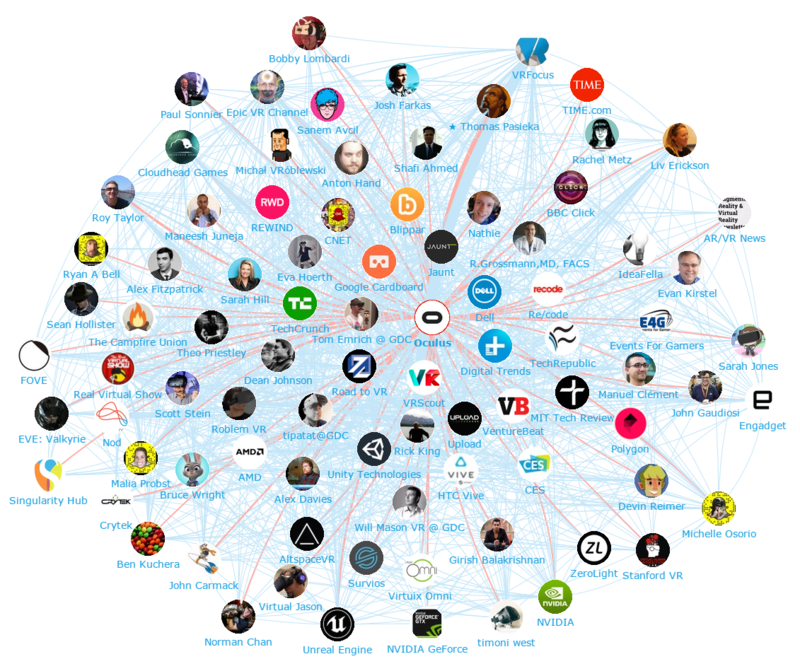 Below you can see another network map created with our Influencer Relationship Management software (IRM) showing the #2 brand HTC Vive the centre, and the conversations to and from the different influencers in their field. If you are interested in learning more about identifying, managing and engaging with influencers click here to get in touch! 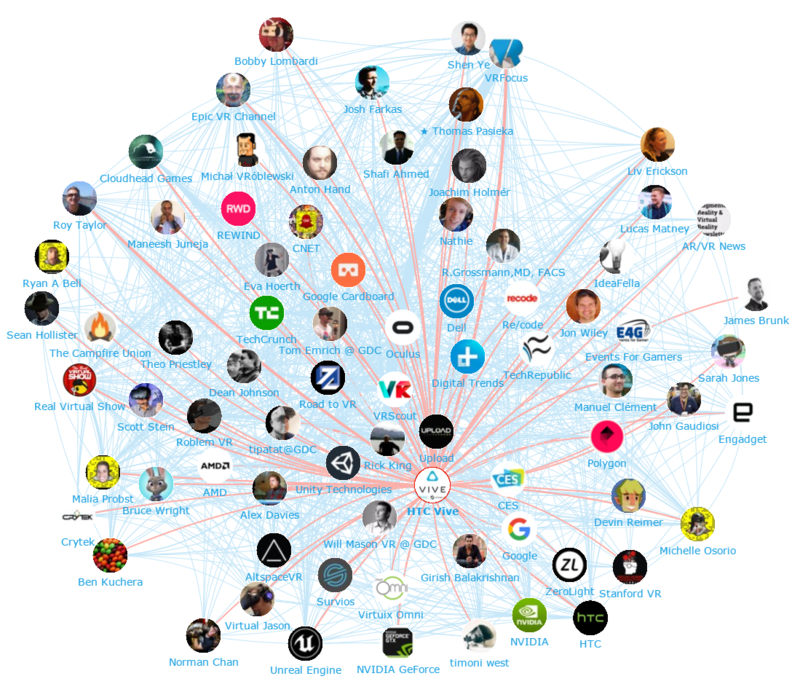 We looked at all the individuals engaging on Twitter to bring you a list of the top influencers in virtual reality. This list is a rich mix of tech journalists, developers, enthusiasts, authors, keynote speakers and also interestingly some digital health influencers. Below is the top 50, if you want to see who ranks from 50-100 be sure to download the full report by clicking the download button below. In the top 100 brands we can find a great selection of big VR vendors such as Oculus and HTCVive, as well as some cool new startups, tech publications and industry resources. It’s interesting to note the high amount of gaming blogs and brands that appear on the list illustrating the excitement for VR in the gaming sector. 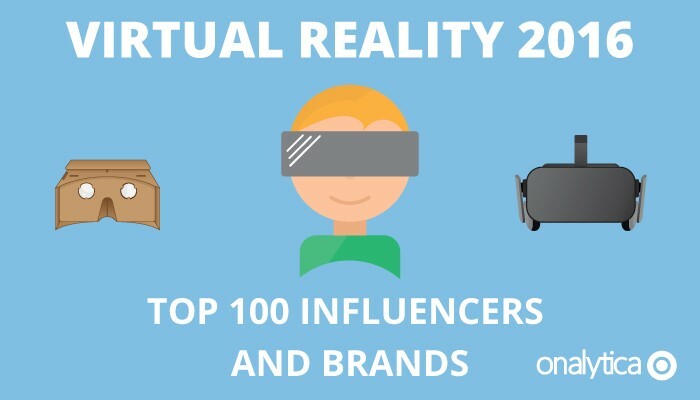 Be sure to download the full analysis for free to get an idea of who are most influential virtual reality brands. Disclaimer: As ever with these lists, it must be stressed that the ranking is by no means a definitive measurement of influence, as there is no such thing. The brands and individuals listed are undoubtedly influential when it comes to driving discussion in the Virtual Reality debate.